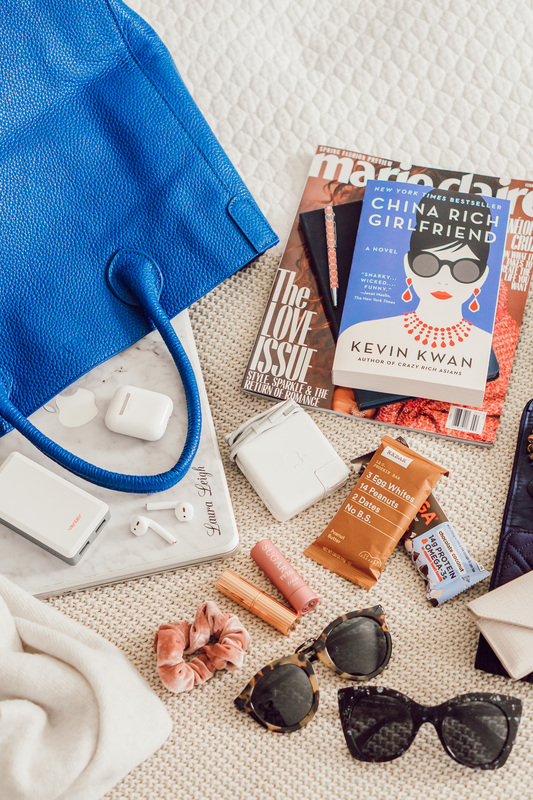 Spilling all the details about what I put in my NYFW carry on bag! From electronics to entertainment, necessities, and more! Happy Friday y’all! Last night I touched down in NYC with Morgan to attend our second NYFW. Yay! So I thought it would be fun to share what I have in my carry on for this trip. 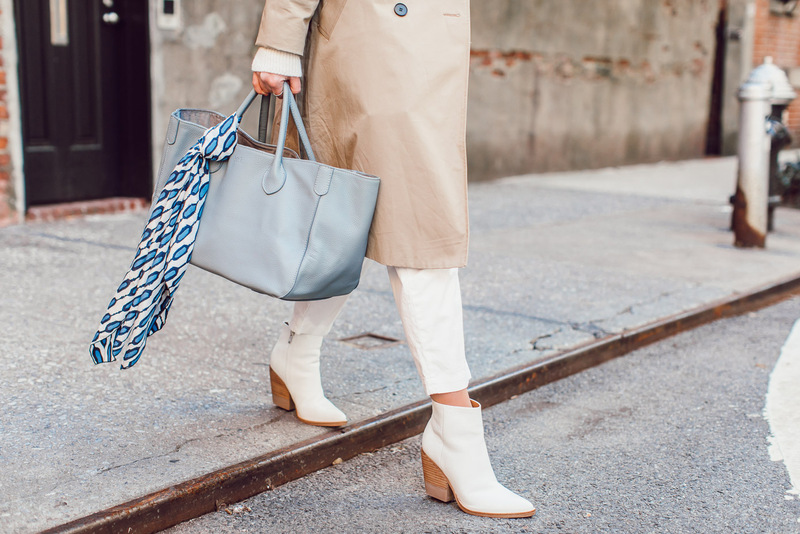 First off, I’m carrying this gorgeous blue leather tote from Beck Bags. 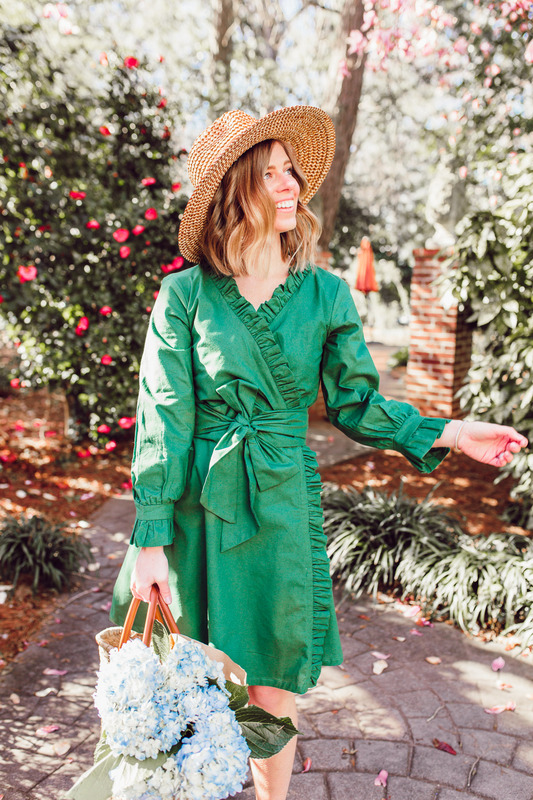 I couldn’t be more obsessed with it and it truly is the ideal tote for traveling. HUGE – fits all the necessities plus more. 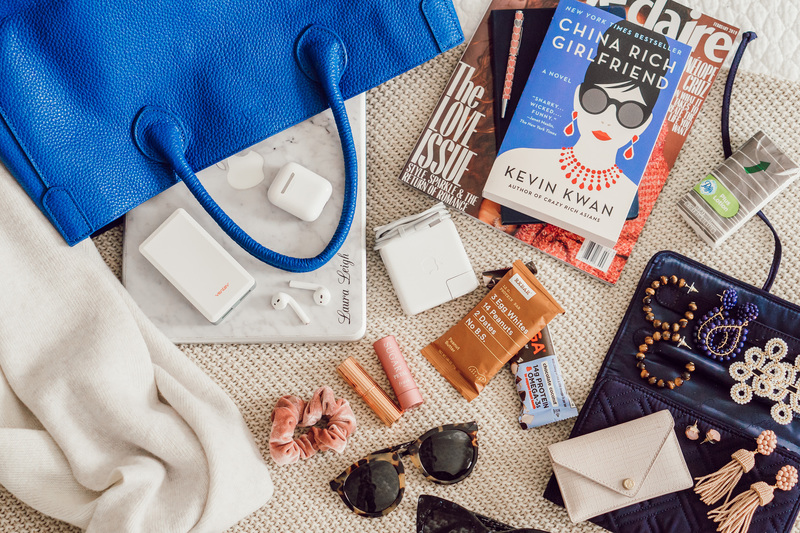 Plus has a zip pocket for you to plus items like your passport (if needed), lipsticks/chapstick, and all those little things that easily get lost in a big purse. Keep reading for details of what I’m bringing, what keeps me organized, and more! Laptop: An absolute have to have! Especially on a work/media trip. I typically work on blog posts during flights and love to add photos from my trip while on it, so need Lightroom! I know some people love using the Lightroom app on their phone to edit but I HATE doing it on my phone. So I really cannot leave it behind. Card Case: A must have for any business person at all times. This card case goes with me everywhere. You never know who you’re going to meet and when you will need a business card. Chargers: Because hello – laptop, cellphone, portable charger, and camera. Obviously, I am highly dependent on technology and these are my little lifelines haha. Sunnies: I carry these in my carry on to keep them save and at times, they’re needed when getting off the plane. Also, just easy access for when you’ve picked up your bag and are headed out of the airport. No digging through your suitcase is necessary. Plus, you never know, it may be super sunny on the airplane and you may want to soak that all in by leaving your window open. Or have no control over it due to your seat mate and need some shield to see your screen. Snacks: I’m hungry 99% of the time and for some reason when I’m traveling, I’m even more hungry. Therefore, having snacks on hand are an absolute must! 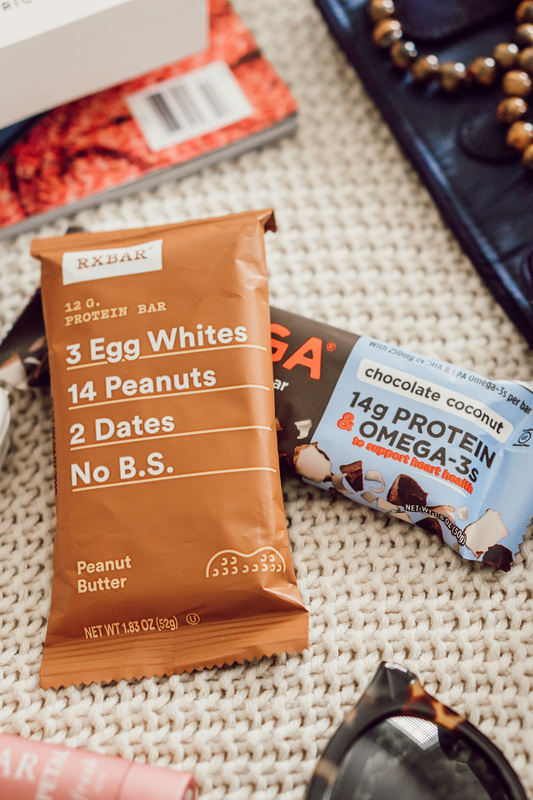 For me, I always have RXBars, collagen peptides, and epic jerky bars. AirPods: I could not be more obsessed with these. I use them every single day at the gym and when I go on walks. I haven’t yet used them in the airport or on flight but I’m pretty sure I’ll be equally as obsessed. Jewelry: My mom instilled this in me. Always have your jewelry with you. It is one of the pieces most likely to be taken if you leave it in your checked bag. Also, if your check bag happens to get lost, there goes your jewelry. Therefore, I always carry my jewelry in my carry on. Cashmere Scarf: 9 times out of ten airplanes are freezing. So I always bring a scarf to wear as a blanket. Magazines & Book: A have to have when flying! I love picking out a magazine or two in the airport. Typically fashion related or something like People. Flights are the perfect opportunity to step away from electronics and read. So when I have the opportunity to do so (and don’t have a blog post to write), I read! This trip I am reading China Rich Girlfriend after watching Crazy Rich Asians last month. Tissues: Having the sniffles on the plane is the worst! You annoy yourself and those around you. 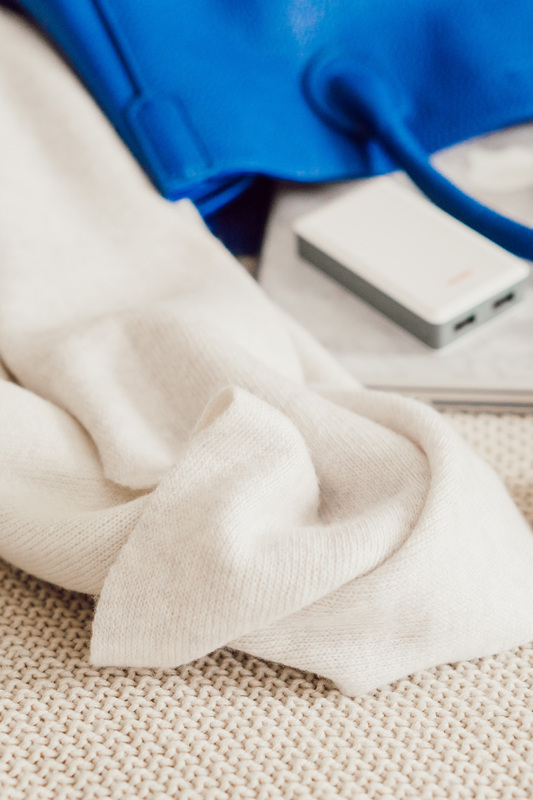 Having tissues on hand are a total lifesaver – keep your nose in check! Camera: Not pictured here as it was taking the photos haha but I always carry my camera with me. To keep it save and give me piece of mind. Also, you never know when something may be photo worthy so loving having it on head, just in case! Scrunchie: This scrunchie thing is new but I’ve always carried at least one hair tie in my carry on bag. You never know when you’ll be over your hair and want to throw it up! Now spill! What do you have in your carry on? Anything out of the ordinary!? I always LOVE seeing what’s in people’s carry on bag! Agree with ALL of your items! It really is so fun to see what others carry – what they HAVE to have with them! And yay – so glad you agree with all of them! Loving the gorgeous color of that bag! And I totally agree about Lightroom on the phone – it’s kind of the worst! Also, thanks for reminding me that I need to read the sequal to CRA! Thank you so much gal! So glad you agree with me on the Lightroom app – felt like I was the only one feeling that way haha. Okay love this post and seeing everything you carry in your carry on bag! I’m right there with you and I hate Lightroom on the phone so having my laptop with me is definitely a must. I also adore airpods. I just wish there was a way that you could watch the in flight movies with your airpods!! And enjoy China Rich Girlfriend! It’s my absolute favorite series and it’s so amazing. Have fun at NYFW! Yay! I am so happy to hear that. Oh I am loving that everyone feels the same about the Lightroom app. Thrilled to not be alone in that feeling. Oh yay! Now I’m even more excited to get further into the book. Thanks so much gal! 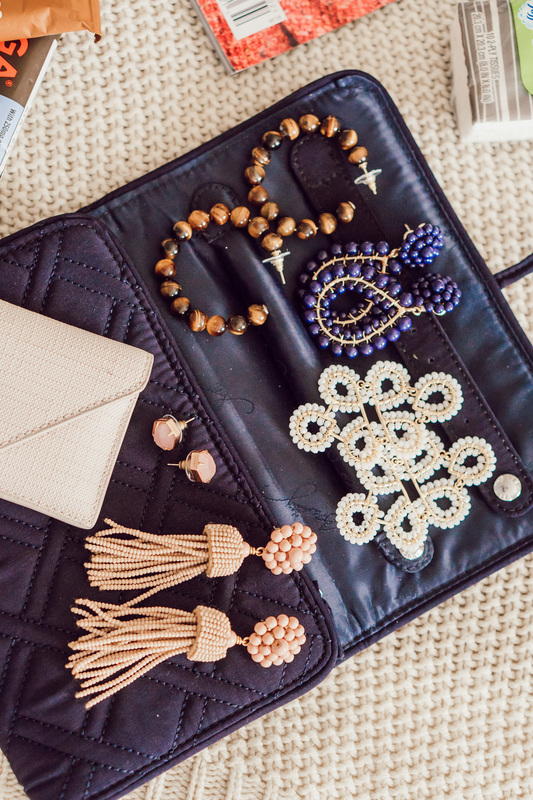 I love your jewelry organizer! I always struggle how to pack my jewelry. Where did you get it? Thank you gal! It is from Vera Bradley – sadly not available right now. Hoping they bring it back in stock. YES! All of the good things. Traveling pro! Great tips. I love these types of posts! I need to just go ahead and get AirPods. Not sure why I’ve waited so long. Yes girl! 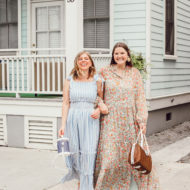 They are absolutely amazing – love them! All of these things are necessary – esp the book! Love this so much GF! Couldn’t agree more! Thank you so much Cathclaire. All the essentials!! And the BEST bag to put them in! 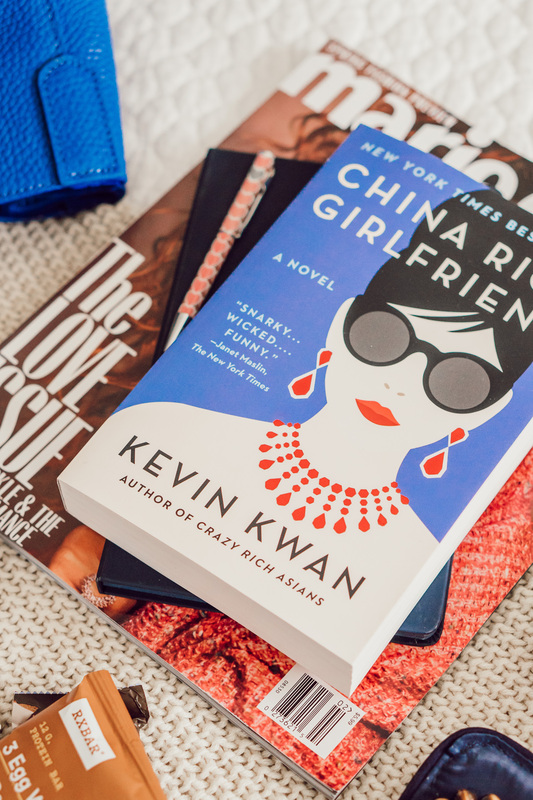 Love that blue tote, and I read China Rich Girlfriend too! It was SO GOOD! Did you read all three in the series? They are so good, I couldn’t put them down! Can’t wait to hear about your NYFW trip! Thank you so much! It was the absolute best for travel. This is the first one I have read. I saw the movie and decided to go from there. So excited to get further into the book and read the third one! I always have snacks during NYFW. I get so cranky in between meetings and shows. Haha yes girl! With you on that! 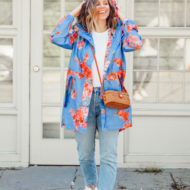 Loving this post girly! I travel a lot for work and I’m always looking for new things that make my life more efficient. Scarves on the plane are my biggest go-to because you never know if it is going to be warm or cold. Yay!! I am so thrilled to hear that. And yes, I completely agree! I’m with you… snacks are a must have, at all times! looks like you have all the essentials! This post is perfect! I’ve been wanting to get airpods, but I’m struggling to spend that much. I always have snacks with me, those are a must! Oh my goodness, thank you lady! I really appreciate that compliment 🙂 Oh I totally recommend them. They are worth it to you so quickly! I totally get that! With you on that 🙂 thanks for checking it out gal! Absolutely love these essentials! They all come in handy when traveling. Thank you Emily! Definitely agree with you!